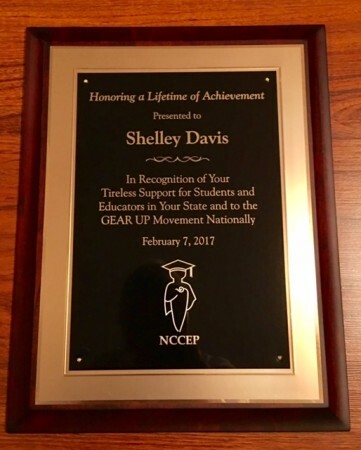 At the 2017 GEAR UP Capacity Building Workshop, California GEAR UP director Shelley Davis was presented with a lifetime achievement award. These are her remarks. As the director of the California State GEAR UP program over the past 17 years, I have had the distinct pleasure to learn from and support a wonderful team of professionals in service to thousands of educators, students, families, and communities throughout the state of California. Our work has been driven by a deep commitment to social justice and equity for ALL in the pursuit of academic success. This is clearly demonstrated by the testimonials of those we serve, the positive outcomes of our efforts, the many lessons learned and contributions to the statewide and national school reform agenda. While we have had a significant impact in this important work, there is still much to do. Since 2001 I have worked alongside individuals and organizations that place a high value on educational equity and access which provided the foundation for true collaboration and meaningful relationships. I live and work by these principles, which I believe are more important now than ever before. To my GEAR UP family and friends out there, know that there are moments every day that you have the opportunity to impact a students life. Seize these moments, work tirelessly to fight for those who don’t have a voice, and know that you will be on the right side of history.